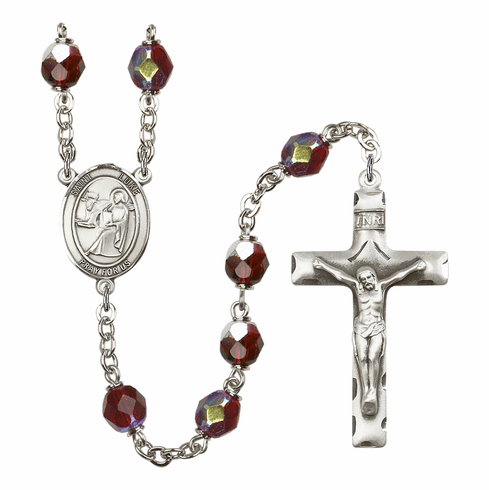 These beautiful 7mm Lock Link Aurora Borealis Garnet Beads Light Rhodium-Plated rosaries comes with a lovely crucifix and your favorite patron saint centerpiece. All of the patron saint rosary are made in the USA and come in a deluxe gift box. Our Christian prayer rosaries are handmade by a group of talented artisans here at Bliss Manufacturing in Rhode Island. Each rosary is custom made at time of order. Please allow 3 to 5 business days before shipping. Patron saint rosaries can be engraved on back of the centerpiece with your own personalized message; a standard engraving charge will be applied. Bliss Manufacturing rosaries come with a lifetime guarantee against tarnishing and breakage. These rosaries are a wonderful gift to celebrate a Birthday, Confirmation, Baptism, Christmas or to celebrate one's Faith.